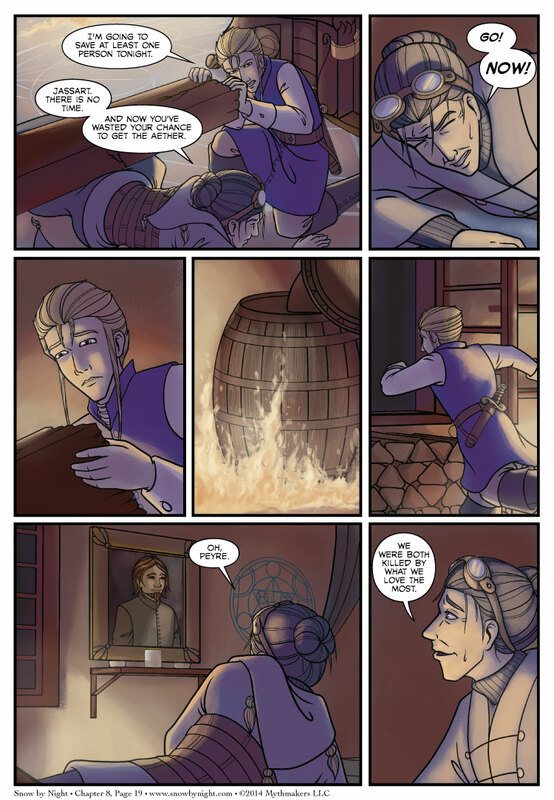 Jassart squanders his chance to get the aether on Chapter 8 Page 19. Poor Jassart. He put a human life before aether. Bertrande does not approve. To see a hint of what happens to Jassart next, please vote for Snow by Night on Top Web Comics. It’s been a busy week in the press department. Two Geeks Talking has uploaded our interview from last Saturday. Kurt asks us all sorts of questions about Snow by Night and webcomics. There’s a spoiler section at the end where Brittany and I give away far too much of what we have in store. And Brittany was interviewed by Katsucon, while she was in the Artist Alley. She does a great job representing us. Way to go, Brittany! Art Contest! Two weeks to go. Cash prizes to the winners. Glory and honor to all who enter. oohhh nooo, she was killed by what she loved most! Right, and her late-husband loved getting tossed about and drowned in the rapids, lol. He stayed until the gunpowder barrels were about to blow. Staying any further would just mean dying pointlessly. Staying that long was pretty courageous. Not many would have. Bertrande asked Jassart three times before he stopped trying to save her. That’s as much as you could expect from anyone in a burning building. Especially a building about to litterally blow up. Selfish people don’t stay that long to help someone. Notice that Jassart actually kept trying instead of taking the aether. Which is what he would have done if he was motivated solely by greed. I guess that plague won’t be cured after all. Wow, he did one slightly unselfish thing, sort of, in a split-second moment of panic. That totally cancels out the entire lifetime of previous completely selfish behavior. Goodbye Bertrande, you were an awesome character.